This creamy tortellini with sausage and spinach is the perfect comfort food on a cold winter night. We are hunkering down for winter storm Jayden in the Northeast, and I prepared this dish so I would have a nice hot meal for the next few days. 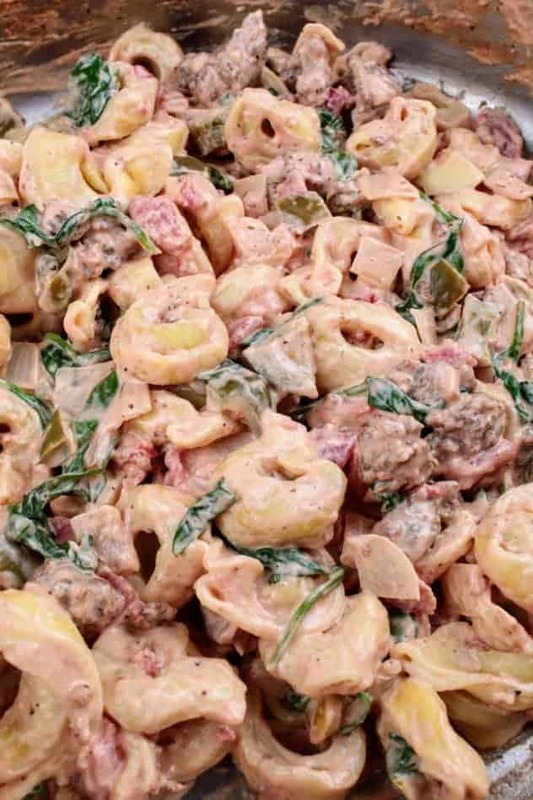 This creamy tortellini with sausage and spinach is made in less than 30 minutes, making it a great option for a quick meal during the work week! This is one of my favorite dishes to make when I am pressed for time, and want something hearty and warm. 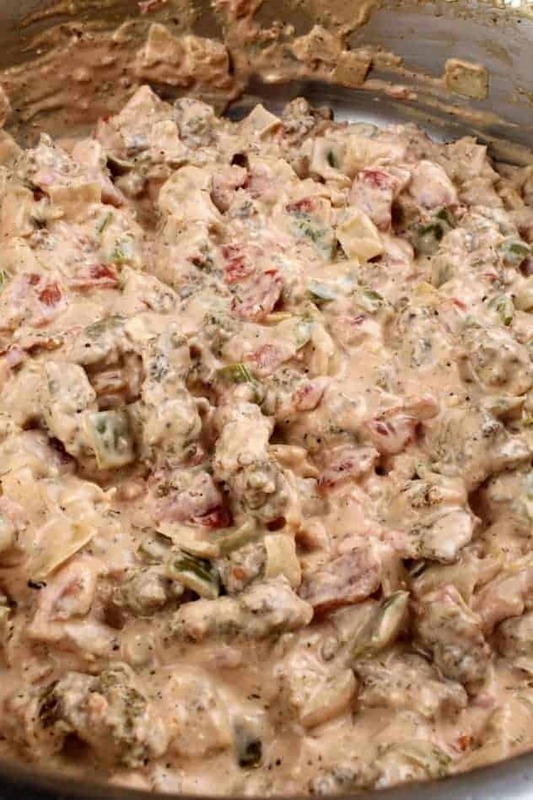 The cream cheese mingles really well with the juices of the diced tomatoes to make a creamy sauce that envelopes the vegetables and tortellini. You can use all of your favorite pasta sauces on tortellini. The only sauces I would be careful with, are any sauces that have the same base as the filling of your tortellini. 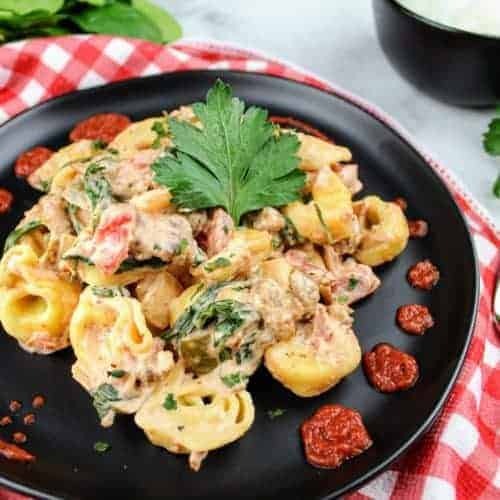 For example, a cheese based sauce might be too much when paired with a cheese tortellini, but might pair well with a meat or spinach filled tortellini. As a general rule, I do consider how the filling of the tortellini might pair with the sauce I am looking to coat it with. What types of tortellini are there? The only kind of tortellini I have seen in my area, are cheese filled tortellini. Usually it will be a single cheese, or sometimes a cheese blend. However, if you make your own, you can stuff them with whatever you want! Does tortellini float when done? This is actually a common myth for tortellini: yes, the tortellini will float during the cooking process but it doesn’t indicate that they are ‘done,’ or cooked to the proper internal temperature. The package usually specifies the internal temperature the tortellini must reach to be considered fully cooked. 1. 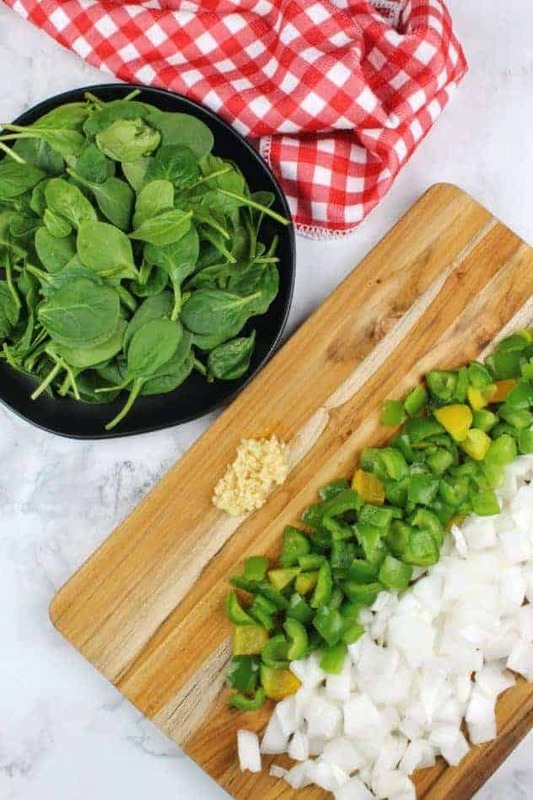 Prep vegetables by chopping bell pepper and onion, and mincing the garlic cloves. 2. Heat extra light olive oil in a large pan over medium-high heat until it starts to shimmer. Add in bell pepper and onion. Saute for 5-7 minutes, or until onion is translucent. Add garlic and cook for an additional minute, or until fragrant. 3. Start a pot of boiling water to cook the tortellini. Remove vegetables from the pan. Add a little more extra light olive oil to the pan and heat over medium-high heat until it starts to shimmer. Add sausage and cook 4-5 minutes, or until cooked all the way through. 4. Add tortellini to the pot of boiling water and cook according to package directions. To the pan with the browned sausage, add back the vegetable mixture, diced tomatoes, Italian seasoning, salt, pepper, and cream cheese. Cook until cream cheese is melted, stirring occasionally. 5. Add in the spinach. Cook until wilted, stirring occasionally. 6. Add cooked and drained tortellini to the pan, stir until coated. Garnish with fresh parsley if desired and serve with rolls or a piece of bread. ARE YOU MAKING THIS RECIPE OR OTHERS? Share your creations with me by posting a photo on my Facebook page, share it on Instagram, share it on Twitter, or save it to Pinterest with the tag #thepanickedfoodie. 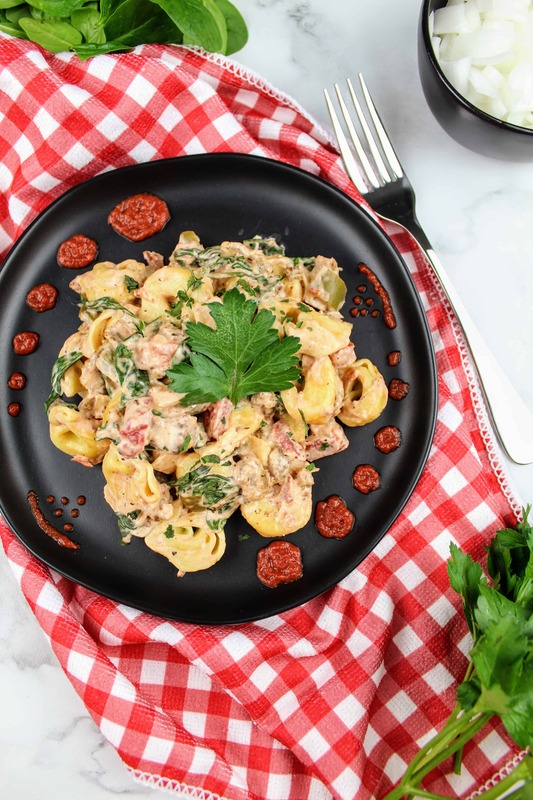 This creamy tortellini with sausage and spinach is the perfect comfort food for a cold, winter night! Garnish with fresh parsley if desired, and serve with a roll or a piece of bread. Heat extra light olive oil in a large pan over medium-high heat until it starts to shimmer. Add in bell pepper and onion. Saute for 5-7 minutes, or until onion is translucent. Add garlic and cook for an additional minute, or until fragrant. Start a pot of boiling water to cook the tortellini. 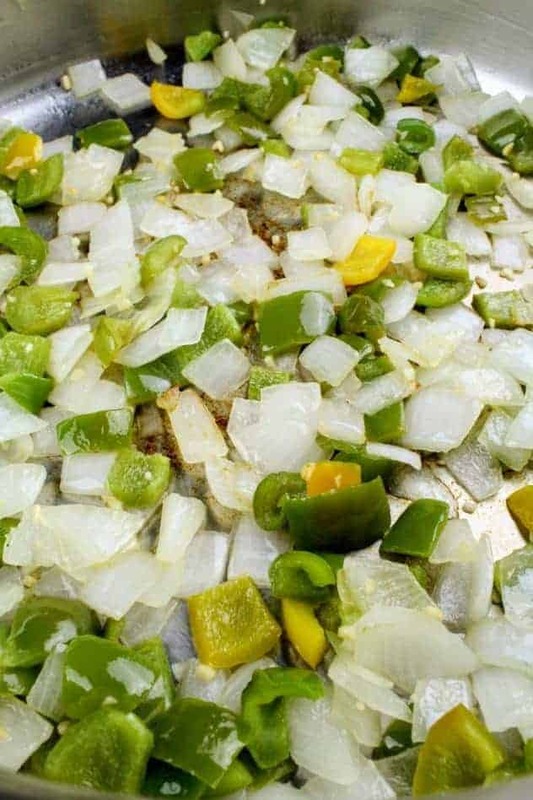 Remove vegetables from the pan. Add a little more extra light olive oil to the pan and heat over medium-high heat until it starts to shimmer. 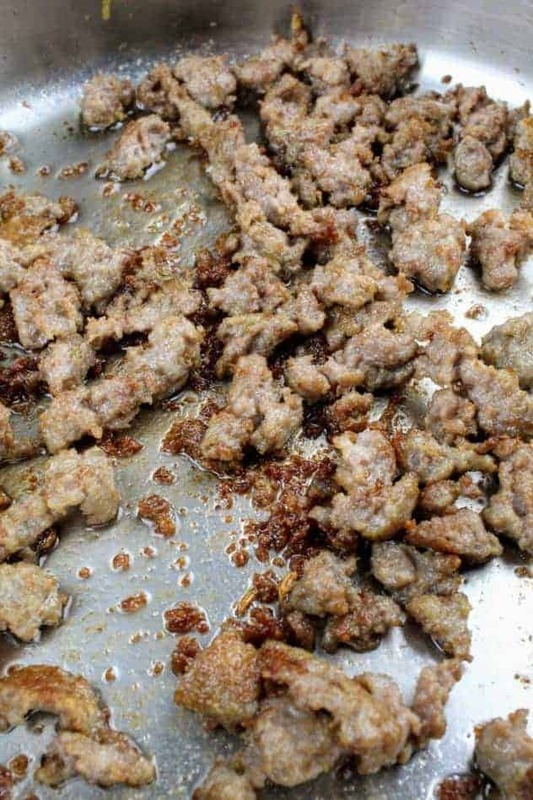 Add sausage and cook 4-5 minutes, or until cooked all the way through. Add tortellini to the pot of boiling water and cook according to package directions. 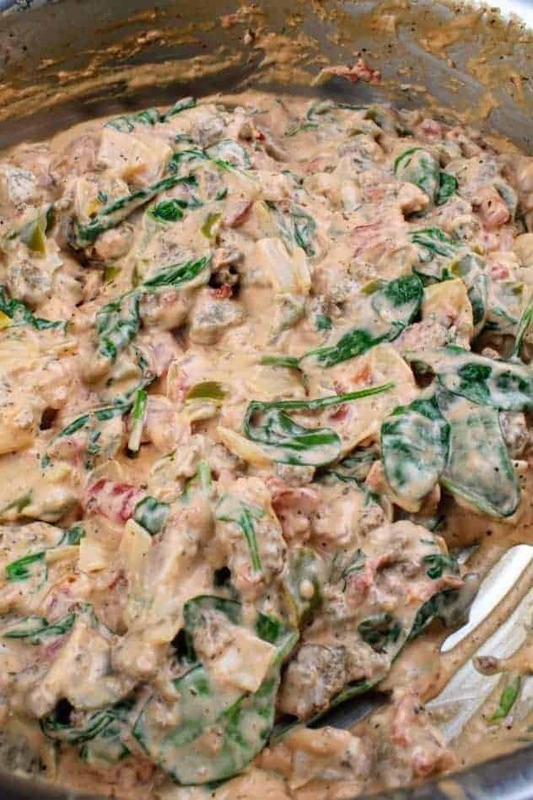 To the pan with the browned sausage, add back the vegetable mixture, diced tomatoes, Italian seasoning, salt, pepper, and cream cheese. Cook until cream cheese is melted, stirring occasionally. Add in the spinach. Cook until wilted, stirring occasionally. Add cooked and drained tortellini to the pan, stir until coated. Garnish with fresh parsley if desired and serve with a roll or a piece of bread. Gonna try it this weekend! Thanks for sharing! This looks amazing. I’ll put it on my next meal plan. Oh this is so perfect and yummy looking for a busy weeknight! This looks delicious! I will need to try this out for my family! I love tortellini!! Thank you for a great recipe idea. I’m sure my kids will love this. Oh gosh this looks soo delicious. I’ll definitely try cooking it! I AM MAKING THIS TOMORROW. i HAVE EVERYTHING HOME, I HOPE IT COMES OUT AS DELICIOUS AS YOURS. That looks so tasty! Think I am definitely going to have to try that out from dinner one night next week! Super simple to make after work. Mmmm, this looks delicious! I have to make the tortellini by hand because we don’t have that here in Japan. ButI will try to make this! I love Italian food! Especially after visiting Italy last year. Your recipe really looks authentic! I can’t wait to make it! Thanks for sharing recipe with beautiful pictures. This looks so delicious and the way you shared it looks fantastic.